In Catholic piety, worship of the Eucharist and devotion to the Blessed Virgin Mary are usually seen as two separate things. There are religious orders dedicated to promoting each. The Blessed Sacrament Fathers, founded by St. Peter Julian Eymard, are among those who have as their purpose the promotion of Eucharistic worship. 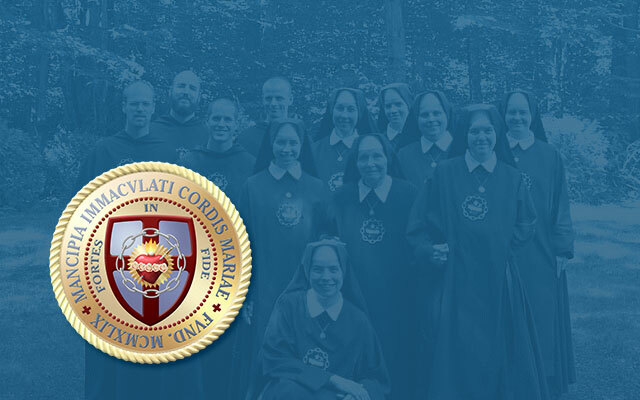 The Montfort Fathers — Missionaries of the Company of Mary — founded by St. Louis de Montfort, are one of numerous orders that aim to promote devotion to Our Lady. The reflections that follow here have to do with joining worship of the Eucharist with devotion to Our Lady. They are not offered because this writer, an ordinary layman, would ever presume himself able to give surer spiritual guidance than such as the Blessed Sacrament and Montfort Fathers. Rather, it is in the hope that other laymen who do not think very much on spiritual things may do so when they hear them discussed by someone like themselves. That many do not think on them, and specifically on the matters we are discussing, is obvious. That is, however hard the Blessed Sacrament and Montfort Fathers and others have labored in the past, and may still do, two things are clearly lacking in many Catholics today: first, a strong sense of the Real Presence — a poll taken a few years ago showed that no more than about 30 percent of U.S. Catholics even believe in It — and, second, much real devotion to Our Lady. There are no recent poll results on Catholic attitudes nowadays toward the Blessed Virgin Mary, but we may fairly surmise that if she had any real role in the lives of many Catholics today — if they really thought of her as their Spiritual Mother watching over them as all mothers watch over their children — they would not behave as they do. For instance, we would not hear from them — from women now, as well as men — the barracks language that is commonplace today. Persons simply do not talk that way, not even if they are living in a barracks, if they think their mother is in earshot. Reference was just made to the Blessed Virgin Mary as our Spiritual Mother. Given the sorry state of catechetics today — given the sorry state of true Marian devotion (as well as Eucharistic worship) — nothing can be taken for granted; it cannot be assumed that all Catholics reached by these lines, not even all Traditional ones, will know how and when Mary became our Spiritual Mother. Accordingly, it seems desirable here at the beginning of these lines to explain. It was at Calvary. It was when Our Lord, dying on the Cross, said to John, the Beloved Disciple, “Behold thy Mother.” In that moment, Mary became in a sense the Mother of all men, even as Jesus Christ as the Lord of all men was dying to redeem all. However, John was at Calvary not simply as a man. He was an apostle. He was there as a representative of the Church. Thus, it was of the Church that Mary was made Mother in a particular way, and thereby Spiritual Mother of the Church’s members, ourselves, if we are Catholic. More will be said about the Spiritual Maternity of Mary later in these reflections. Right now, let us return to our point that Mary clearly has not much of a real role in the lives of many Catholics today and that many are also lacking in a strong sense of the Real Presence. If worship of the Eucharist and devotion to Mary can be joined, could they fortify each other in such a way that Catholics now insensible to the Real Presence and to Mary watching over them would become alive, or more so, to both? This writer believes that could be. Fortunately, in trying to show how they may be joined, I am not on my own; I do not have to worry overmuch about being presumptuous. There are the writings of others to guide me — to guide us — including writings of two saints I have already named, St. Louis de Montfort and St. Peter Julian Eymard. Writings of the latter are especially important here, though, properly speaking, St. Peter Julian wrote little. What we mainly have from him are letters and the record of lectures and homilies he gave in the 1860s to priests of his order, some of whom got them down on paper. Readers familiar with that record will recognize how closely these present reflections follow in the traces of the Apostle of the Eucharist. Readers familiar with things I have written for From The Housetops the past few years will also know that culture is important to me. Let me touch on it again, but relating it to our present subject. Culturally speaking, a civilization is what results when men in a particular place and time live according to their beliefs and principles. When men in Europe and European outposts around the world, like the Americas, lived according to Christian beliefs and principles, the result was Christian civilization, one so great that its influence eventually extended into non-Christian lands like China, India, and Mohammedan parts of the planet. If our civilization today is not Christian but materialistic, it is because most professed Christians now lead the lives of practical atheists by living according to their own will instead of God’s. If Christian civilization ever is to be revived, it will be by men living according to God’s will, which is to speak of men seeking sanctification. In His infinite love for us, God has provided means for our sanctification. None is more potent or necessary, and none more evidences His love, than the Holy Eucharist where He makes Himself available to us under the appearance of bread and wine. Therefore, Catholics can advance toward their own sanctification and, at the same time, begin to revive Catholic culture and Christian civilization by daring to believe, and daring to affirm their belief in, that which today’s materialistic world would deny: the reality of God’s Presence in the Holy Eucharist. Regular readers may also remember a recent article of mine, “Saint Mary of Victory “. Therein, I recalled that as gentle, as loving, as prayerful as only Mary, our Spiritual Mother, can be, the Church has also traditionally applied to her the description from the Song of Songs, “terrible as an army set in battle array.” I considered in the article how she has in history repeatedly shown herself to be exactly that. This has been at such places as Covadonga in 718, Poitiers in 732, Lepanto in 1571, White Mountain in 1620, La Rochelle in 1627, Jasna Gora in 1655 and Vienna in 1683. These are among places where Catholic warriors, battling in defense of Christendom, fought and beat back armed forces of Mohammedanism and Protestantism, and did it beneath banners emblazoned with Mary’s image and with her name, Sancta Maria , as their battle-cry. That Muller had seen Mary “terrible as an army set in battle array” should not surprise us. More exactly, it should not surprise us that she so showed herself to him. It is the point of relating this famous story once more: Which ordinary mother will not fight if need be to defend her children? How much more likely and how much more fearsomely will the Mother of God and the Mother of the Church, our Spiritual Mother, fight to defend her own! As remaining faithful Catholics battle today against awful odds both to remain faithful and (against even worse odds) to make society Christian again — and that they must do if they are faithful to Our Lord’s last commandment, to make disciples of all the nations — who better to lead them than she who is terrible as an army set in battle array? Under who else’s banner could they better fight than Our Lady’s? Her name by itself, Sancta Maria , will provide the hope and therefore the strength to fight on, for centuries if need be, as Spanish Catholics, invoking Mary as Our Lady of Battles, had to fight for 700 years before finally recapturing all of their land from its Mohammedan occupiers. If today’s fighters are only in the early stages of what will prove to be an equally long struggle, they should understand there is no end to God’s mercy, no end to the help He gives. He gives us His Mother for our own, but He also gives us Himself. It is in the Holy Eucharist. Before we speak of joining worship of the Eucharist with devotion to Mary, it is in order to speak first about the Eucharist Itself, and to speak, first of all, about obstacles to belief in the Real Presence. More precisely, we should speak of overcoming them. After all, we have recalled that fewer than a third of U.S. Catholics believe in the Real Presence anymore. It may be unseemly or even positively wrong to speak from personal experience, but allow this writer to express the view that, if most Catholics do not now believe in the Real Presence, it is because the teaching on it, as on so much else, has gone too widely untaught for too long. I say that because belief in the Real Presence was not difficult for me when I converted to the Faith. (This is why speaking from personal experience can be wrong: Our own experience can lead us to suppose that because belief has been easy for oneself, it ought to be for others.) It remains, once one accepts the Incarnation itself, once one believes, as Hilaire Belloc put it, that a Palestinian peasant 2,000 years ago was God, it should not be hard to believe that, at a certain point in the Mass, He will become present, really present, in the hands of the priest there at the altar. He is God. He can do anything. That said, it is to be supposed that even if the teaching on the Real Presence were taught as it should be, belief would still be difficult for some number. Well, first they should not allow themselves to think that Jesus Christ would lie. True, they may not consciously think of Him doing so, but their unbelief nonetheless amounts to an accusation of falsehood. He did say: “This is my Body. This is my Blood.” He should not be accused of lying when He said it. Neither ought His power be denied. We said a moment ago: God can do anything. But why would He choose to make Himself present under the appearances He does — a bit of bread, a few drops of wine — instead of in a way that would show unmistakably that He is there? Only think if He did! Only think if He came in all His might and majesty and glory as He will on the Last Day, and think, when on that day He does, how all mankind, the living and the dead, will tremble. When He is elevated in the hands of the priest or is in the tabernacle, we do not tremble before Him. We can adore Him. He wants to be adored. He is entitled to be adored. That He comes to us under the appearances He does is a proof of His goodness, of His love, and if we must not accuse Him of falsehood, neither must we despise His goodness and His love. We must not be like the disciples who heard the Eucharistic promise and, in the words of Scripture, “went back and walked no more” with Him. We must not because to go back, to walk no more with Him, is to reject Him. Of course there are those who do reject Him. They damn themselves. It is an aside, but folks are living for a longer time nowadays. This writer’s mother recently passed away at 86. I have a mother-in-law who is 97. Advanced age like that is becoming more common. Our oldsters need our prayers. It is not simply that, thanks to contraception and abortion, they grow more numerous while the younger population that supports them grows smaller; society may even be tempted to kill them off. The “death with dignity” movement could be preparing the way. More to the point of these reflections, it may be easier to think of putting away the oldsters because many of them are not nice, not very lovable. On the contrary, many are mean, they are bitter. These are persons who wanted something in this life more than they wanted God. In His place they set up an idol: money, a luxurious home, a brilliant career, or perhaps nothing but pleasure and happiness. In any event, it eluded them, they did not obtain it, and that has left them bitter. It may be impossible to speak to such a person about God. A relative, a priest, someone will try, and the oldster will say, “Get out of here with that nonsense!” How sad. I speak of such persons because there are others who do not reject God that violently, but who think they have outgrown religion, that it is for children, not for adults grappling with life’s adult problems, problems that beset them constantly, that really do make life hard. All of us who are adult have to deal with problems, and they can cloud our minds with anxiety and worry. For some, they can give rise to doubt, doubt about God’s goodness, doubt about His existence, doubt that He makes Himself available to us on the altar. When assailed by doubt, what needs to be done is to forget one’s adulthood, to think back to when one was a child. The man who does this, who thinks back, even if it was as an adult convert that he received his first Holy Communion, will remember that there was at least one day in his life when he was happy. That happiness — the happiness of being at peace — can be had again. All that is needed is restored belief, the consent of the will, the willingness to turn from real falsehood — from false beliefs contrived by human minds attempting to explain away God — to truths revealed by Him. The mystery is that men will believe in the falsehoods they do instead of in the Real Presence of Our Lord in the Holy Eucharist. Consider some of what is believed: that all the universe and one’s very existence as a human being are the accidental result of purely random events when common experience can see order everywhere from the daily rising of the sun at a predictable hour to the annual flowering of spring after winter’s thaw; that a perfect world, a perfect society, can be shaped by no agency but men themselves when more blood was shed in the last century than any other in history and precisely by men seeking to make the world perfect; that this life is all there is, that there is nothing else. This last false belief has even been exalted by some of the most celebrated philosophers of our modern age as reflecting a kind of heroism. How absurd! No courage is required to face nothing. We said a few lines ago that it is mysterious that men can embrace such false beliefs. Of course, there is nothing really mysterious about it. Our nature is fallen. Ever since the first man and first woman came to believe they could be “as gods,” we have been inclined to believe as we should not — and not to believe as we should. Well, not simply was the Incarnation meant to rescue us from this condition that could produce nothing but our doom. He who was Incarnate also founded a Church whose Sacraments, teachings, and disciplines were meant by Him to safeguard us from ourselves, to preserve us from the dangers that arise from our fallen nature — provided we avail ourselves of the Sacraments, accept and follow the teachings, and submit to the disciplines. To avail ourselves, to accept and follow, and to submit is the way of salvation. There is the Rosary, devotion to the Sacred Heart of Jesus, the Spiritual Exercises of St. Ignatius, penitential fasting, pilgrimages, recitation of the Divine Office, making the Stations of the Cross, devotion to particular saints, invocation of the angels, assisting our brothers and sisters in Christ who are in need, assisting those who are in the greatest need of all, the Poor Souls (who will not forget to pray for us when our prayers and good works on their behalf have liberated them from Purgatory). The practices and devotions are many, but as said at our beginning, we are especially concerned here with two of them: Eucharistic worship and devotion to the Mother of God. We want to see how they may be joined so that they fortify and enrich each other. It could be asked: How can the two ever be truly and completely separated? Jesus, after all, obtains from His Mother the substance of His Body and Blood which we receive in the Holy Eucharist even as we obtain the substance of our own body and blood from our parents. In other words, when we worship the Eucharist, Mary is not far removed. In 17th-century France, a time and land unusually rich in the production of saints, no mystery was more the object of meditation than the Incarnation. Saints like Louis de Montfort used often to meditate on, and speak of “Jesus in Mary.” It was a reference to the months when His Mother bore Him in her womb, but with the Eucharist we can see her in Him, the Mother in the Son. This is the truth that is the most fitting for us to take as our starting point as we consider joining worship of the Eucharist with devotion to Mary. But it is simply our starting point because, as the Mother of God, Mary does more than furnish Him His Body and Blood from her own. This even as every mother does more for her child than give him birth. Yet, if the truth that the Body and Blood we receive in the Holy Eucharist are derived in their substance from Mary is simply our starting point, it is a truth we want to have constantly in mind as we here proceed. Another point is that He did give her to us to be our mother also, our Spiritual Mother. We have said that that was at Calvary, but the giving, the actual moment of it and what preceded it, deserves more thought than we earlier devoted to it. After all, there is a definite moment when each of us becomes the child of our natural mother. We are not conceived, no more than we are born into this world, at any old time. Neither is our soul imprinted in such a way as to make us recognizable to our Heavenly Father as one of His children at any time except the moment of our baptism. Yet, these moments — the moment of our conception, of our birth, of our baptism — are all known to the Father from all eternity. Even so, we could say that in a sense Mary was our Spiritual Mother as soon as she was in the mind of God, which was really from all eternity. This is inasmuch as His idea of her had to embrace her Motherhood of all men, and of the Church in particular. Yet, even as time would have to pass and the history of the Jewish people unfold to a certain point before His Incarnation, Mary’s Motherhood, her Spiritual Maternity, could not begin to become manifest — it could not be seen as willed by God — until her own Immaculate Conception. But even full of grace as she was at her Immaculate Conception, more time had to pass before Mary’s Spiritual Maternity of all men and the Church was made perfectly clear. Evidently a certain preparation was needed. This was even as her Son Himself would, in the words of Scripture, “increase in wisdom, and age, and grace” before He affirmed His Kingship of the world to the world. As much of His increase in wisdom, age, and grace was in the home provided by Mary and Joseph (let us never forget St. Joseph! ), much of her preparation must have taken place during the years of her girlhood that Tradition tells us she spent in the Temple. Those years passed. Time and history unfolded to the point of the Annunciation. Even as we can say that in a sense Mary was our Spiritual Mother from when the mind of God thought of her, we might also say that inasmuch as she is the Mother of God and He is the Lord of us all, she became our Spiritual Mother at the moment of His conception in her womb — the moment of her famous ” fiat .” Her Motherhood still was not manifest, however. More preparation was needed. This is to speculate, but may it not have involved conversations, intimate conversations, that surely would have taken place between Mary and Jesus before Calvary? There was her real preparation, her real schooling, if one may dare to use the word in this regard. It was a schooling in all the mysteries with their Author for Teacher. The curriculum had to include her own role in salvation history, her role as Mediatrix of all graces, and, finally, her role as Spiritual Mother of all men and the Church in particular — something of which she always had understanding, but an understanding now made perfect by her Divine Son. An analogy can be offered. In the days when there were still many kings, one of them would die and immediately there was a cry, “God save the King!” The reference was to the deceased king’s successor. From that moment all subjects of the new monarch, even members of his own family, would bow before him and call him Majesty. This even as at her Immaculate Conception angels bowed before Mary, and sang praises to her glory. The earthly monarch would still await coronation before his majesty was made manifest by the crown placed on his head. Calvary was Mary’s coronation. Then her Spiritual Maternity was made known. That Maternity is what allows us to turn to her with our prayers more confident of her hearing us than we could be if we turned to a natural parent, let alone any other purely natural agency, with some need. If she will not fail to obtain for us, when petitioned, all the graces necessary in order to persevere in Christian living, to persevere in the way of salvation, and the Church so teaches, it is not to be supposed that she would fail to lead us to her Son Himself. Since His Ascension into Heaven, He is wherever we find the Holy Eucharist. How does she lead us to Him there? Exactly as a good mother would, a Mother, moreover, who is also — let us recall — our leader, the one who will provide the hope and strength necessary as we battle to remain faithful, and battle eventually to recapture society. Mothers are the ones who form their children, and leaders best lead by example. According to Tradition, Mary lived on earth for 25 years after her Son ascended into Heaven. That she spent this time here must have been willed by Him. That she consented to His will in this matter is to be expected since she did in all things. That He would deprive Himself of her company in Heaven, company He cherished as no other on earth, is more striking. No one was, or is, closer to Him than His Mother. He loves no one more than her. Why did He will her to remain? Why did she consent? Doubtless she spent those twenty additional years on earth in order to assist the Church in its beginnings. She would have done this by speaking of her Son to the Apostles and other members of the growing Church, sharing with them her memories of Him, memories no one else had, and sharing her understanding of all the mysteries as He had imparted it to her. There is also another thing she would have done. She would have shown how to adore Him in the Holy Eucharist, and this is where she becomes our exemplar. Think of Jesus becoming present to her whenever St. John said Mass, think of her at the foot of the tabernacle. On her knees there, she becomes a model, the perfect model, for our own Eucharistic adoration. Because no one knows Jesus better than His Mother, no one better understands His giving, or better understands what the giving costs Him. (Love always exacts sacrifices, always produces suffering. It is its nature.) In the case of Jesus instituting the Holy Eucharist, Mary understands the struggle of His Sacred Heart, how His love must struggle against the unbelief and indifference of most of the world, how His sanctity must struggle against impiety as well as actual blasphemy and sacrilege, how His goodness must struggle against the ingratitude of Christians who fail to receive Him in Holy Communion, thereby rejecting the gift He makes of Himself. Mary understands all this, and understands how His love triumphs over all of it, how He loves in spite of everything, how nothing we do will discourage or conquer His goodness. She understands and, because she does, her love goes out to Him all the more. As we contemplate Mary’s understanding, let our love be as hers. Let also our love of her as our Spiritual Mother increase in gratitude for the love and goodness she shows us by leading us in this way to her Son in the Holy Eucharist. That is how we can pray to our Spiritual Mother. Then, with her beside us in spirit, and His Presence Real in the Blessed Sacrament, may the love we feel begin to transform us. It surely will if it is genuine, if we know His Presence is Real and we believe she is with us. It should change even the way we are in church, the way we carry ourselves, the way we kneel or sit, where we put our attention. It should be on Our Lord. Who would slouch or chatter with neighbors in the presence of a head of state? To be in the Real Presence of Our Lord Jesus Christ asks more of us than our attention and erect posture. It demands our reverence. It demands our worship. Doubtless there is more that could be said about joining worship of Jesus Christ in the Holy Eucharist with devotion to His Mother, our Spiritual Mother given to us by Him at Calvary. Doubtless there is more that could be said about His Real Presence and her Spiritual Maternity. But this writer has reached the limit of what he is able to say. Let me conclude then, but with a prayer, one that was written out in his own hand by Pope St. Pius X on December 30, 1905: Domina nostra Sanctissimi Sacramenti, ora pro nobis. Our Lady of the Most Blessed Sacrament, pray for us.